Penny PM on the Importance of a Change Control Management Process during the Testing Phase. 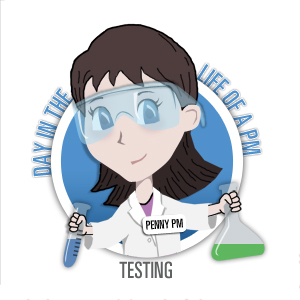 Penny PM says, “Team, make sure you have your lab coats on and test tubes ready – we are going to be testing the system!” As we talked about last month, change control is a very important aspect of a project which may be utilized frequently during the testing. Change control is not a bad thing. It is really a way to provide an audit trail of what was changed and why. During early stages of testing, it is not uncommon to find what we would call a “defect” or error during the test; the reason for the error can be a number of things. The change control process will help guide the defect to resolution by documentation and communication. Using a testing tool is a great way to manage not only what will be tested, but also the outcome of each test. Penny PM tells the team, “The testing tool will give us a method to track specific test cases which include: the steps to be tested, the data required and other details such as who the tester was, pass or fail, date it was tested, etc.” In addition, Penny PM shows the project leads how they can run reports based on various types of selection criteria such as owner, phase of test plan, test case name, status, amongst other things. The key to a successful project is to test, test again and test some more; by using a testing tool to track your testing, it will help you to remember everything you should test, what you have tested and, of course, a documented audit trail supporting the results. If you don’t, then your test tube may just blow up in your face and no one would want that. To read more about how to create a HPQC test plan, please click here. This entry was posted in Day in the Life of a PM. Bookmark the permalink.